Designed for support and comfort following trauma or post-operative procedure. The lightweight design and pre-shaped ergonomic frame help to modify the level of pressure on the injury at both the malleoli and lower leg. The soft nylon/foam liner has an integrated pump design making the pneumatic liner simple to inflate and adjust. If you experience any pain, swelling, sensation changes, or any unusual reactions while using this product, consult your medical professional immediately. Do not overinflate aircells. Improper aircell inflation may cause significant irritation in patients with diabetic neuropathy. Reduce aircell compression with any visual skin changes or reported discomfort. Do not use this device on patients incapable of communicating physical discomfort. Like all lower extremity immobilizers, such as casts or braces, patients without sensation (ie: post-op anesthesia, neuropathies, etc.) should be monitored frequently for "hot spots", skin irritation or wound management. Use caution when walking on slippery or wet surfaces to avoid injury. At high altitudes the aircells will expand beyond optimal level. Adjust aircell pressure by tightening or loosening straps. Always consult with your physician or therapist before making changes to the brace. Always inspect before use. Check for broken stitches or parts; torn, cut or frayed material; or buckles, or hook and loop fasteners that do not hold securely. Do not use damaged product. Discontinue use when torn, worn, frayed in any way. Never alter or repair this product. This product is not intended to be used with any other product except DJO approved accessories. I am having surgery in two days and on a weight reduction plan, I will be having the XCELTRAX AIR, SMALL. What is its weight, please? Thanks. The Procare XcelTrax Air Tall weighs about 3.7lbs. I am wearing a boot and now my hip hurts. How tall of a heal do I need to wear on my other foot? How much does the tall boot weigh ? The Procare XcelTrax Air Tall boot weighs 2.094 lbs in size small. I need a metal, fixed ankle brace will this work??? And can I get extra liners? The boot I'm looking at does not specify right or left foot but the people at the medical supply store needed to know which I needed. Why don't you need to know which one I need? What are the actual size/dimensions differences between small and medium? Small 10" X 5.25" X 16.5"
Medium 11.75" X 5.4" X 17.5"
I have a Achilles tendon rupture. I am scheduled for surgery at the end of December. The surgeon put me in a XcelTrax walking boot. Do you have instructions on proper way to walk with this? And how long should I wear this on a normal day? can you wear long pants and put the air cast over them? I have a torn ligament In my foot. My friend has this for hers. Im a 5.5 which.says I go for a x-small. But how does the boot run? That size. Do I get. I suffer from 2 ruptured achillies tendons and plantar fasciitis on both feet. I was advised by my doctor that I need to be in walking boots for the time being, So I need a walking boot that will accommodate both issues in one boot. What boots should I be looking at that offer the combo. I have a foot injury and I'm wearing a Large Procare XcelTrax Air Tall walking boot. I work in a factory that requires steel toe shoes. I cannot find a slip-on steel toe that will fit over the end of the boot. Do you offer a protective cover for this boot? What is the actual size/dimensions differences between and large and medium? 240 lbs athletic guy. Lower calf muscle tear, what would you recommend ? I have worn the X small for a metatarsal foot fracture fro 1 week now. It seems very heavy, as I am 98 pounds. Is a pediatric boot lighter? Is the XCel Trax Air Tall Boot interchangeable with the right and left foot? Thank you for your question. Yes you can use the foot on the right or the left foot. Will a male shoe size 12.5 with a calf about 20" around fit in the XL? Thank you for your question. The Procare XcelTrax Air Tall accommodates a 17" calf. I need to know the weight of a walking boot. It is black with 4 straps and goes up to the knee. Thank you for your question. The aprox. weight of a Medium is 2.5 pounds. How do I clean the felt insert to prevent it from odor? You will want to hand wash the liner, you can use a light detergent. Make sure to rinse completely and hang dry. The insole can be wiped down with a damp cloth. Thank you for you question. I've been wearing your boot for 11 weeks post trauma. Healing is slower than I hoped for and Velcro fasteners are loosing adhesive ness . What if anything can be done to extend the life of the boot? Thank you for contacting Product Support. Unfortunatly once velcro stops working there is not much that can be done except replace the velcro. The Xce/Trax air walker does not have replacement straps avialable, but your walker is still under warrenty and can be replaced with a new one. You can call DJO customer care at 1-800-336-6569 and speak to them about getting a replacement since the velcro is not working properly on yours. If you have any other questions please feel free to contact us. I've been using a friend's Xcel Trax Air Tall, but would prefer not to cause more wear and tear on her boot. I'm ready to purchase one for the rest of my prescribed time to wear a boot. It is a medium size, but I see that from your size chart that you recommend a small for a woman's size 7 1/2, I have not found the medium size uncomfortable, but would like to hear what you recommend and why? The difference is going to be the length of the footbed. The small will be shorter. If you are a size 8 women's shoe I recommend going up to the next size. If you are a 7 1/2 I recommend the small. I am 6'2" and 230lbs. I am 3 weeks post-op of Tib-Fib fracture about 3 or 4" above the ankle, which was repaired with a secured rod through the tibia. Will the pneumatic cells on this particular model support my fracture at that location or should I consider the Aircast XP Walker, which as I understand has upper pneumatic cells? Also, will either of these models support my weight? I recommend the top of the line boot we currently offer. 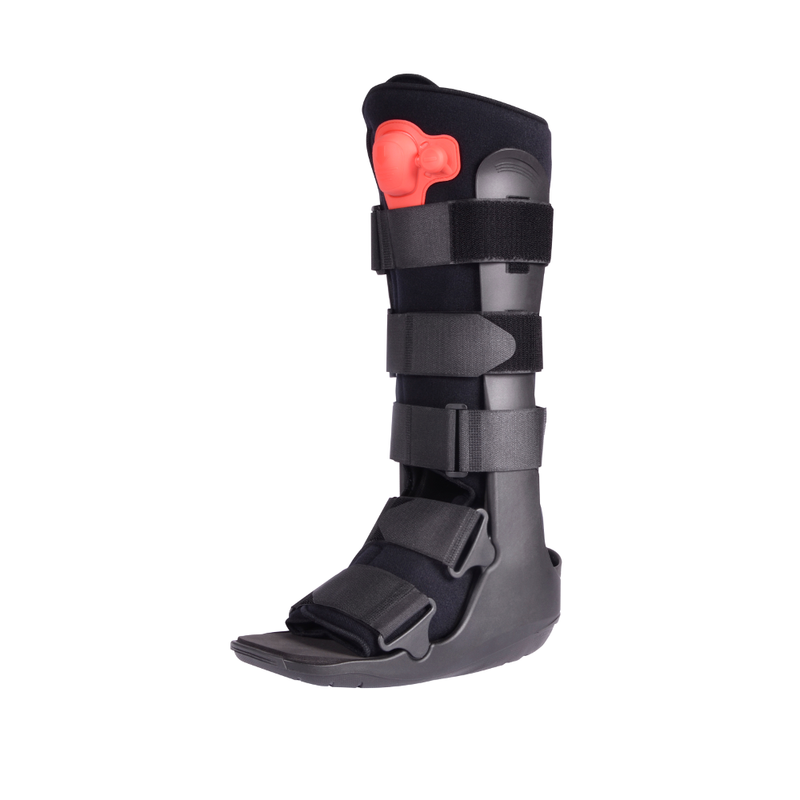 The Aircast Walkiing Boot XP, this boot has 3 aircells that you can adjust for comfort. Great product, especially if you develope anxieties from having a foot/leg cast. I like relieving the pressure around my ankle when resting my foot and being able to tighten it before getting up and moving around. Highly recommend. Will Recommend and use Better Braces again and again! I have severe ligament damage on right ankle. Talked to Expert and asked questions about boot, He was very helpful. I decided to have brace shipped overnight. I was very apprehensive the delivery would arrive the next day as assured by the Expert. WOW the boot arrived from California to Michigan in less than 12 hrs. The boot is very High quality and reasonably priced. Thank You Better Braces for all Your Amazing service! So glad to get my new ProCare XCELTRAX. Velcro sticks and holds and the pneumatic works great! I really like the support and confidence it provides when I ambulate. Thank you for the prompt delivery too! Cons: Wish it came with more than one liner especially during SW USA summers . Could alternate while one is being cleaned and is drying. With only one liner I am "grounded" until it dries after being washed. I am having to wear one of these after surgery to repair a shattered leg bone and torn ligament. I like it much better than a cast. Pros: Can be removed to shower. Can open to relieve pressure, get dressed or apply ice packs.